Once upon a time, the city of Constantinople was the center of civilization. If you were to visit the bustling meyhanes (bars) in present-day Istanbul’s back alleyways, you would be forgiven for thinking it still is. Today, the 2010 European Capital of Culture is doing its best to reassert its former glory and give proof that history does repeat itself. Women in burqas walking side by side with scantily-clad friends, churches converted to mosques – these are just a few examples of the East-meets-West juxtaposition that is so prevalent in Istanbul. While London and New York, and to a lesser extent Paris, offer incredible displays of diversity, none are as deeply rooted in their historical underpinnings and offer the unique sense of self that Istanbul displays. 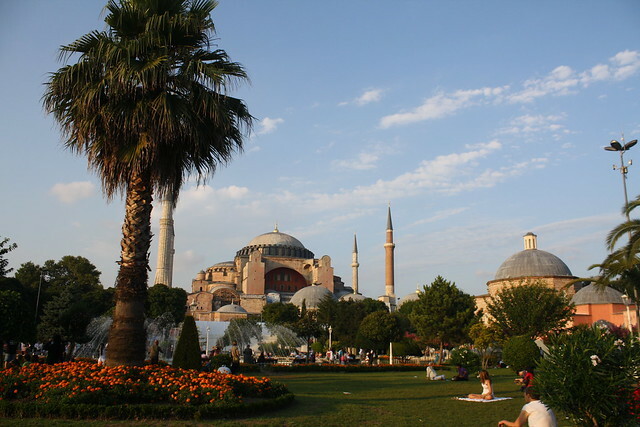 Laura and I stayed in the Old City of Sultanahmet, which is home to the city’s most famous sights. From our hotel rooftop terrace we had a view of two of the best: the Hagia Sophia (Ayasofya in Turkish) and the Blue Mosque (officially Sultan Ahmed Mosque or Sultanahmet Camii in Turkish). Architecture is not immune to the East-West dichotomy found in every other facet of Istanbul life. Many of Istanbul’s greatest sights are churches from the early Christian periods converted to mosques when it was brought into the Ottoman Empire. Almost all agree the exterior of the neighboring Blue Mosque is superior in beauty to the Hagia Sophia. But the most beautiful interior, that is the Hagia Sophia’s alone. The clean lines, beautiful Arabic calligraphy and lack of ostentatious ornamentation found in many churches and Hindu and Buddhist temples make the Hagia Sophia a sight to see. Combine those qualities with the massive and inconceivable vaulted domes, stone-textured walls and cream-white latticework and you have the most beautiful place of worship anywhere in the world. Staying in Sultanahmet, we were able to avoid the crush of tour buses visiting the Blue Mosque and see it as the Muslims who come to worship here do. I snuck in just before the call to prayer when they close the mosque to outside visitors and witnessed the hushed tranquility of its interiors. I was quickly taken aback by the mosque’s restrained beauty. Raised Catholic, watching the prostrating worshippers awakened me to the stark contrasts of the two religions. 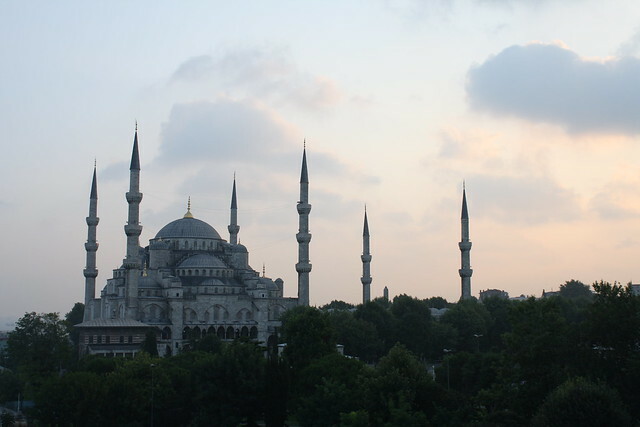 The Blue Mosque, like most other mosques, is carpeted throughout. Instead of the hollow sound of my shoes meeting a marble church floor, I instead enjoyed the warmth of the simple but intricately-patterned carpet under my bare feet. It’s virtually impossible not to notice the blue Iznik tiles adorning the interior and give cause for the mosque’s nickname. Inside wrought-iron chandeliers holding 21st century votive candles, glass cups filled with energy-efficient light bulbs, endow the mosque with an incredible atmosphere, especially so in the evening. Because Istanbul was named the 2010 European Cultural Capital the city is looking extra-swish, with flowers in full bloom and grass never looking greener. 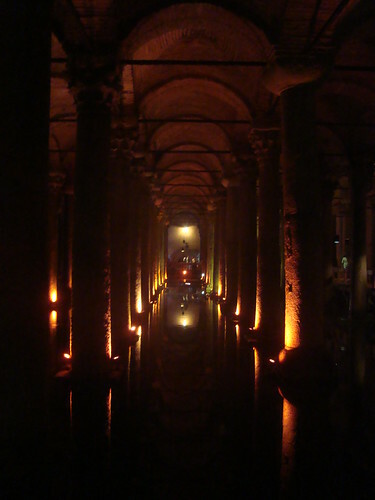 The history and beauty continue away and out from the main square to include the lesser-known but equally fascinating sights Little Ayasofya and Basilica Cistern. The cistern, an underwater chapel replete with sculptures of Medusa, dates back several hundreds of years before its rediscovery by a visiting historian and scholar who had heard locals’ talk of drawing water and even catching fish from buckets lowered from their apartment floors. On top of possessing a dizzying array of sights Istanbul has to be the city that truly never sleeps. It makes New York City or Buenos Aires, the two giants of nocturnal activities in my experience, seem like Springfield (take your pick) on a Tuesday night. I am not exaggerating when I say thousands of people, mostly Istanbulites and other Turks, are out in the streets until 2 or 3 a.m., even on weeknights. The back alleys of the bohemian Beyoglu neighborhood are chock-full of tables soaking themselves in raki, an anis-like drink similar to ouzo, and Efes Pilsner, the Turkish beer of choice. We witnessed the power of alcohol and the subsequent lowering of inhibition as locals displayed Turkish dancing en masse and sang along to Turkish anthems being belted from rowdy pubs. We arrived on a Tuesday and watched each night as the crowds swelled larger and the party hours lengthened. By Saturday, it had reached full tilt. Only at 3:30 a.m., when we decided to call it quits, were the masses moving from Beyoglu’s back alleyways and into clubs where the party would continue until seven or eight in the morning. Sunday, presumably reserved for family time (or as the only buffer between weeknights and the weekend for Turks), was the only night there seemed to be some sense of calm in the city, and even then the scene was livelier than most big cities on a weekend night. Istanbul smells spicy. Really. Perhaps all that eclecticism has to manifest itself through some physical outpouring because there were some funky smells swirling about. Bad body odor aside, there are plenty of good smells in the city, such as the wonderful aroma of a kebap roasting on a spit. For travelers on a budget (we were), a daily doner fix is a must (make sure to order it with French fries and pita). Istanbul, I should add, is a very expensive city. Although Turkey is not on the Euro (yet), prices are equivalent to or even greater than many Euro-using capital cities. That being said, Laura and I tried our best to gravitate to the other good smells of the city. The smell of grilled fish sandwiches near the Galata Bridge, which connects the old and new towns, reeks of an institution as old as the bridge itself. As long as there has been fish, water and fire there have been fish sandwiches underneath the Galata Bridge. The sandwiches themselves are nothing special, but the ritual and tradition that goes along with it certainly merit the modest $3 price tag. 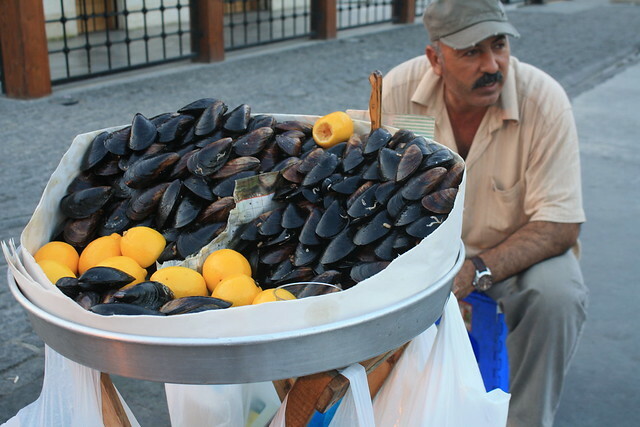 Istanbulites typically dine in big groups and eat meze, appetizers akin to Spanish tapas or Italian antipasti. In almost any traditional Istanbul eatery the waiter will bring a wooden platter to the table to show the goods firsthand, whereupon the table selects from a variety of meze: eggplant, stuffed peppers and tomatoes, vine leaves, tapenades, kofte (minced meat rolled into meatballs) and different types of salted fish. If you haven’t smelled, or better yet, sampled a fair share of meze, you have not been to Istanbul. Over the years and through my travels I’ve developed an odd fascination with border towns and crossings. The strange ambiguity of border towns, representing two different worlds and a melting of cultures is for me a microcosm of what it is to travel: to perceive as normal what others view as new and different. Over the course of hundreds, thousands of years even, Istanbulites have prospered, fallen down and picked themselves back up to assimilate into a culture they have created through war and trade and love and lust. It is not this distinctive blend of cultures and customs, however, which makes this city straddling both sides of the Bosphorous so exceptional. It’s how easily the people carry these differences and similarities with them that make Istanbul one of the unique cities of the world and worthy of a visit, don’t you think? Turkey is probably one of the countries I’m very excited about… didn’t expect it to be that expensive. But now we know. Brilliant article. 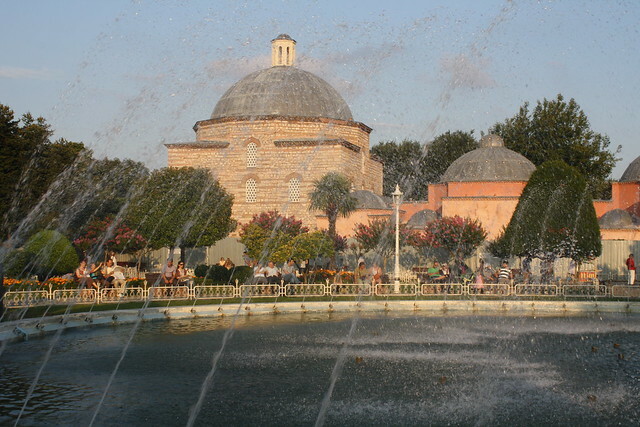 I love Istanbul, especially the Sultan Ahmet area. Istanbul was one of our favorites. I was also disappointed when I saw the prices. Still, as I am sitting in my dusty room in Cairo, I wish we had an extra day or two in Istanbul. By the way, I think your post on Cairo sums up the city pretty well. I don’t think I want to retire here.